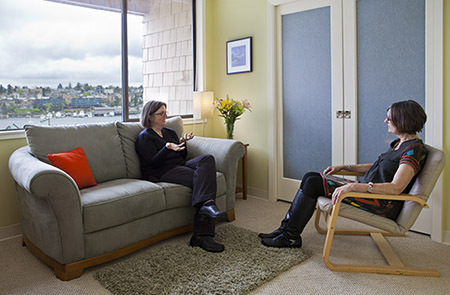 The Women’s Therapy Referral Service process begins with an information session with our referral coordinator, who helps you clarify your therapy needs and coaches you on how to effectively interview several therapists. We believe this personal contact is invaluable in assisting you to move forward with your search. However you obtain referrals, it’s smart to interview more than one counselor or therapist before making your choice. Here are some suggestions for interviewing effectively. Here are some questions to ask yourself before you begin your therapist interviews. What do I want to accomplish in therapy? What are my goals? What kind of approaches am I most drawn to? Am I interested in dealing with a current concern? Do I want to work on underlying emotions or patterns? Am I in need of immediate assistance? How important is it that the therapist have similar values, race, spiritual beliefs, sexual or gender orientation, or life experience to mine? What’s my financial situation? Do I need to use insurance to offset the cost of therapy? When am I available and what locations work best for me? You may want to jot down some notes to take to the consultation. During the meeting, however, try to focus on getting a feel for the counselor, as well as the content of the discussion with her. Then, after the meeting, you can spend a few minutes writing down your impressions. Think of an initial consultation as a fact-finding mission as well as an opportunity to get a sense of the “chemistry.” You’re interviewing counselors as a way to find out what they have to offer and how you would work together in therapy. Letting a therapist know of your hopes, goals, and concerns, as well as any fears or mixed feelings, gives you an opportunity to get valuable feedback that will clarify your search. Here are some questions you may want to ask during the meeting. I’m hoping to work on “x, y, and z” issues. How much experience do you have in these areas? How do you see yourself working with me on these issues? What is your therapeutic approach or style? What is your training and experience? What is your fee? (And if necessary, “Do you offer an adjusted fee? How does that work? “). Do you take insurance and how does that work? Do you have experience working with my ________(e.g. age group, sexual or gender orientation, religious affiliation, race, ethnic or cultural background, etc.)? Are you available to meet outside the therapy session (e.g. phone check-ins, extra sessions, etc.)? Would you be open to meeting for (say) three sessions and then re-evaluating whether we want to work together? Also, each therapist has a Disclosure Statement on file that you can request. It details her training, credentials, treatment philosophy, and office policies. Reviewing the meeting: what makes a good match? The relationship between therapist and client is the basis of successful therapy work, so it’s essential that there’s a good fit between you and your counselor. Here are some questions you may want to ask yourself after the session. What were my first impressions of this therapist? How did I feel as I was leaving the meeting? Did she seem to understand what my concerns are? Did I feel respected, listened to, understood, empowered, accepted? Did I get a sense of how we would proceed if I select her to be my therapist? Was I able to direct the conversation if I wanted to? Did I feel comfortable asking the questions I wanted to ask? How did the environment/room feel? By exploring these questions, you’ll clarify your thoughts and feelings about the interview and be able to make a more informed choice.